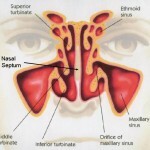 Of all the above conditions, a severe nasal congestion is the most common. 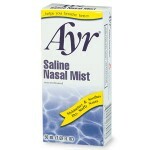 This causes most people who suffer from a deviated septum to breathe from their mouths. 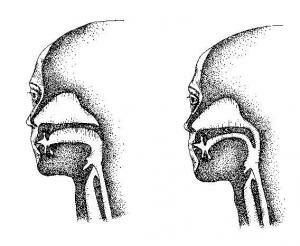 Difference between breathing through your mouth and nose. Colds & Flu’s: The function of your nose is to filter the air which enters your body. When you breathe through your mouth, this is prevented. This will cause an increased suffering from colds and the flu due to the lack of filtering of the pathogens which may be present in the air. Allergies: Since the air is not filtered, you will suffer from an increased susceptibility to allergens. Thus you may find rashes and frequent sneezing. Poor Ventilation: Breathing from your mouth will cause lower amounts of air to reach your lungs, thus all the parts of your lungs will not be ventilated. Smell: When you breather from your mouth, you will not have any sense of smell. A keen sense of smell allows us to enjoy life to its fullest, thus without it you may not enjoy life to its fullest. Oxygen Levels: Since the nostril is smaller in size, it will provide increased resistance to the air flow while exhaling. This will allow your lungs to absorb more oxygen. But if you breathe from your mouth, the resistance to breathing is lowered thus lower amounts of oxygen will reach your brain. Energy levels: If you have lower amounts of oxygen inside your body, then you will also have lower amounts of energy in your body. 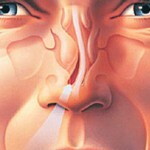 Thus if you suffer from a deviated septum, you must undergo septoplasty and get it cured permanently. This will allow you to have a normal and happy life. So even if the surgery is costly, it is better to undergo the surgery.